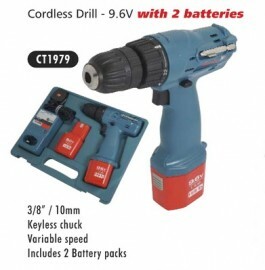 Cordless Drill 9.6V, A well made drill that matches up to well-known brands costing many time more. The drill comes with two batteries which quick charge using the solid state charger. Forward and reverse can be selected easily with the trigger hand and the keyless chuck makes drill changing quick and easy. Torque settings are adjustable making this an ideal and powerful screw driver.